I'm sitting on the concrete floor of a garage, my back against a pole. To my right, a girl braids auburn weave into another girl's hair. Three teenagers sit on a couch to my left and a lone teddy bear, clutching a red velvet heart inscribed with "I Love You," occupies a couch in the corner. The smell of weed permeates the air and a Drake song plays in the distance. Everyone in the room has a drink. Even me. Deirdre, the woman in charge, is puffing on a blunt when her cellphone rings. It's her fourth call in less than twelve minutes. "Hello?" she says, passing the blunt to her eldest daughter. Deirdre's hair is styled in an asymmetrical bob with a solitary blue streak down one side. Her matching sweatsuit set — gray cotton with white detailing — is from the Victoria's Secret Pink collection and has a rhinestoned labrador retriever emblazoned on the breast. She gives the caller directions to her location. "The garage is open, honey," she says. "When you're here, just come to the garage and I'll get them ready for you." She hangs up as two petite women — one carrying a baby, the other a toddler — enter the garage. Deirdre (whom the Express has agreed to not fully identify) showers them with a barrage of questions. How many do you guys want? You want regular or virgin? What flavors do you want? Y'all been here before? Or is it your first time? The women order two pink lemonades and one virgin blueberry drink. "Got it," Deirdre says, heading into the house to retrieve the drinks. A few minutes later, she returns with three slushy-like cocktails. "What time do you close?" asks the shorter of the two women, whom I later learn is only twelve years old. "Every day it varies," Deirdre says. "We have to get supplies and then we might not open until 3 or 4." The twelve-year-old takes a swig of her virgin blueberry drink before responding. "'Cuz, I was trying to come over here with a bunch of friends." "Nah, maybe Monday? Around 4?" the girl says. "Okay, well call me to see if we're open," Deirdre replies. Over the past several months, underground alcoholic beverage retailers have popped up around Northern California, including in Oakland, Vallejo, Stockton, Sacramento, and Patterson. At least a dozen of them exist, all operated by different people, but they all specialize in the same product: coolers. 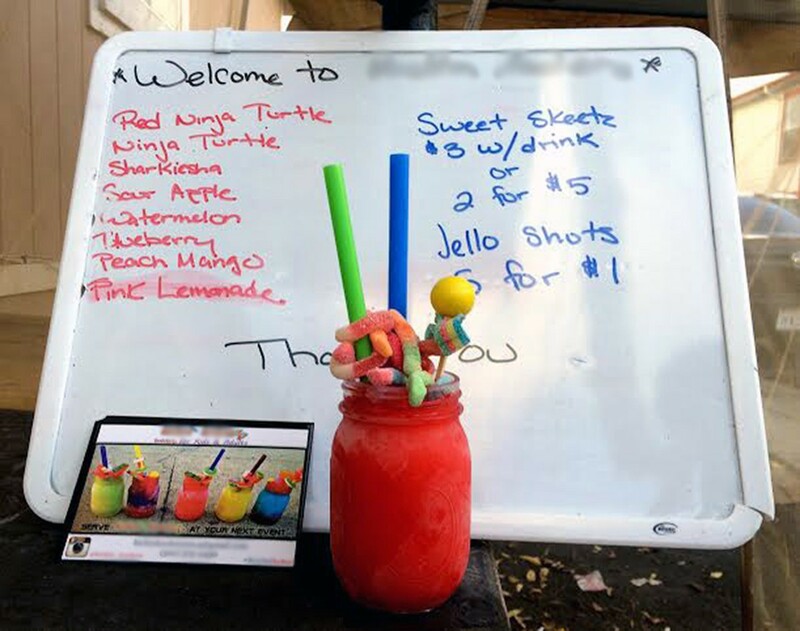 These sweet alcoholic beverages, usually made with vodka, gin, or tequila, come in a variety of flavors, like watermelon and peaches 'n' cream, and generally cost between $8 and $10. If you think the price is steep, there's a reason: These drinks are chock-full of booze, with about one cup of alcohol in each one, according to one seller. The drinks also come with an accoutrement of fruit slices and candy, and instead of plastic cups, they're served in glass Ball jars. Of all the sellers in the Bay Area, perhaps the two most profitable and well known are located in Oakland. Since their launch earlier this year, these sellers had each amassed roughly 8,000 followers on Instagram. Like the other sellers, they only operate through Instagram, where they post pictures of their drinks, announce the flavors of the day, and advertise when they are "open" and when they are "closed." I first learned about these businesses through Instagram, when I saw a picture that somebody had posted of one of the drinks with the caption "Hella good." My interest piqued, I checked out the business' Instagram page, called the listed phone number, and asked how I could buy a drink. Turns out, I was on the right track — calling (or text messaging) the phone number is the first step of the process. You tell the seller how many drinks you want, when you'll pick them up, and then he or she gives you a location — never an exact address — to head to. In addition to the garage, I visited a seller operating out of a driveway and a seller who had set up shop in someone's backyard. Not once did anyone ask to see my ID. The people who run these businesses are, for the most part, regular folks just trying to make an extra buck. They're nurses, beauticians, security guards, and technicians. And they're almost always female. One of the two main sellers in Oakland is open during the week, and the other just for the weekend. On their busiest days, they field hundreds of phone calls and see lines of customers amass outside. Their customer bases include not only students from Mills College, UC Berkeley, and Stanford University, but also locals from the neighborhood. As one seller explained, most customers are inspired by curiosity their first time, and by laziness every time after. "They like the taste," she said, "but some people don't have the time to make it themselves." Operating these businesses through Instagram offers myriad benefits. Unlike a website, which requires purchasing a domain name and paying for web hosting, Instagram is free and can be operated solely through a smartphone, which is advantageous for those without a computer. It's also a good record of one's success and popularity, as indicated through the number of followers or picture "likes" that one has. Many, if not all of these businesses started as seasonal operations, open only for the summer. Though some businesses have since closed, most have stayed open because business has been so good. One seller started her business with only $100, but her profits added up so quickly that she was able to afford a $500 blender a few weeks later. As word of these drinks caught on, so, too did the number of Instagram profiles purporting to sell them. As one seller explained, some of these new businesses were formed by customers who visited the original Oakland locations and decided to start their own in their cities. "Think about it," she said. "It's fun and it's a good way to make money." But not all things that are fun and profitable are legal. Out of all the sellers I spoke with, not one had a license to sell alcohol in the state of California and not one seemed to realize they needed one. Many of them seem to think that having a business license and filing taxes is enough. "I'm not worried," said one seller. "You know why? 'Cuz I went and got a fictitious business license and I got my business cards.'" Liquor licenses are easier to get than many people realize. From 2012 to 2013, there were 10,988 applications for liquor licenses in California and the state Department of Alcohol and Beverage Control (ABC) approved 10,150 of them. However, liquor licenses are extremely expensive. According to John Carr, an ABC spokesperson, an original license to sell beer, wine, and liquor can cost close to $14,000, and comes with an annual renewal fee as high as $876. In other words, these cooler businesses might be profitable, but they're certainly not so profitable that their proprietors can afford liquor licenses. The potential penalty for selling alcohol without a license in the state of California is jail time and a fine. For now, these businesses have managed to fly under the radar, thanks to the murkiness of Instagram, but this likely won't last forever. 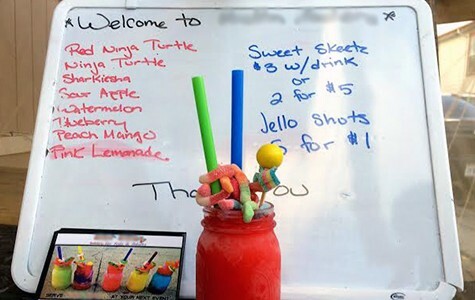 Earlier this year, the State of New York launched an investigation into an alcoholic-slushy business called Phrosties that had 12,000 Instagram followers. Then, seemingly overnight, the business, which had been successfully operating for more than a year, disappeared from Instagram. This precedent paired with a $90,000 grant that the Oakland Police Department recently received to start a program to prevent unlawful alcohol sales, does not bode well for Bay Area businesses. "We're trying to figure out our next step," said one seller when asked about the future. The monthly event NVR OVR pushes aural boundaries and attracts hundreds of followers.